It's finished and the lucky winner is Elizabeth from Heart is Where the Home is. Several of you came close to the correct title "Orangeade". 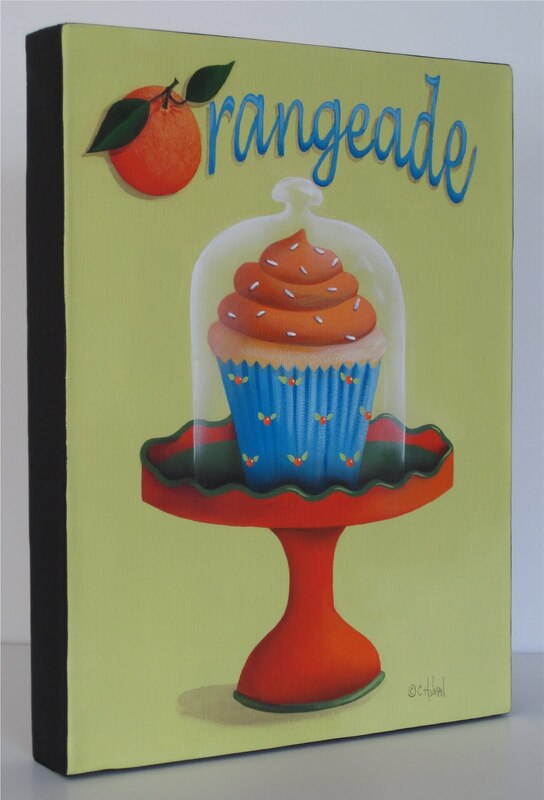 Orange Dreamsicle, Orange Cream Cupcake, Cranberry Orange Cupcake, and Orange Crush are just a few of the titles that came the close to getting the prize. I ended up pulling the name out of basket to get the winner. A tempting delight made from fresh squeezed Florida oranges is displayed on a colorful cupcake stand. These sunny retro colors are sure to brighten any kitchen! This painting is scheduled to be listed on eBay this evening if you are interested! Of course! Congrats to Elizabeth! I'll say it again, you have the best names for your cupcakes. :) Congratulations to Elizabeth! Thank you so very much you have made my day! 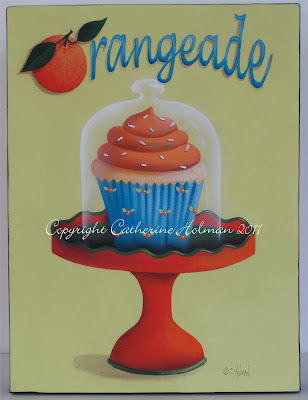 Love this cupcake painting Catherine, kind of like a cool refreshing drink in the summer. 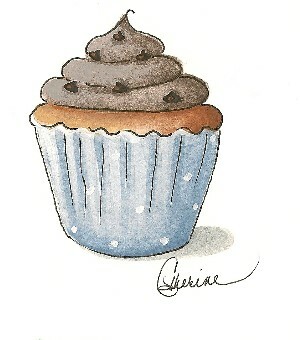 Cathie, what a great cupcake!! I love those vibrant colors! You have inspired me to make cupcakes this weekend ! Oh too cute as usual. I love your style. Your door with the chalkboard is pure genius.